Superconducting devices, though not widely used, have some unique characteristics not available in standard semiconductor devices. High sensitivity with respect to amplification of electrical signals, detection of magnetic fields, and detection of light are prized applications. High speed switching is also possible, though not applied to computers at this time. Conventional superconducting devices must be cooled to within a few degrees of 0 Kelvin (-273 o C). Though, work is proceeding at this time on high temperature superconductor based devices, useable at 90 K and below. This is significant because inexpensive liquid nitrogen may be used for cooling. Superconductivity: Heike Onnes discovered superconductivity in mercury (Hg) in 1911, for which he won a Nobel prize. Most metals decrease electrical resistance with decreasing temperature. Though, most do not decrease to zero resistance as 0 Kelvin is approached. Mercury is unique in that its resistance abruptly drops to zero Ω at 4.2 K. Superconductors lose all resistance abruptly when cooled below their critical temperature, Tc A property of superconductivity is no power loss in conductors. Current may flow in a loop of superconducting wire for thousands of years. Super conductors include lead (Pb), aluminum, (Al), tin (Sn) and niobium (Nb). Cooper pair: Lossless conduction in superconductors is not by ordinary electron flow. Electron flow in normal conductors encounters opposition as collisions with the rigid ionic metal crystal lattice. Decreasing vibrations of the crystal lattice with decreasing temperature accounts for decreasing resistance– up to a point. Lattice vibrations cease at absolute zero, but not the energy dissipating collisions of electrons with the lattice. Thus, normal conductors do not lose all resistance at absolute zero. Electrons in superconductors form a pair of electrons called a cooper pair, as temperature drops below the critical temperature at which superconductivity begins. The cooper pair exists because it is at a lower energy level than unpaired electrons. The electrons are attracted to each other due to the exchange of phonons, very low energy particles related to vibrations. This cooper pair, quantum mechanical entity (particle or wave) is not subject to the normal laws of physics. This entity propagates through the lattice without encountering the metal ions comprising the fixed lattice. Thus, it dissipates no energy. The quantum mechanical nature of the cooper pair only allows it to exchange discrete amounts of energy, not continuously variable amounts. An absolute minimum quantum of energy is acceptable to the cooper pair. If the vibrational energy of the crystal lattice is less, (due to the low temperature), the cooper pair cannot accept it, cannot be scattered by the lattice. Thus, under the critical temperature, the cooper pairs flow unimpeded through the lattice. Josephson junctions: Brian Josephson won a Nobel prize for his 1962 prediction of the Josepheson junction. A Josephson junction is a pair of superconductors bridged by a thin insulator, as in Figure below (b), through which electrons can tunnel. The first Josephson junctions were lead superconductors bridged by an insulator. These days a tri-layer of aluminum and niobium is preferred. Electrons can tunnel through the insulator even with zero voltage applied across the superconductors. If a voltage is applied across the junction, the current decreases and oscillates at a high frequency proportional to voltage. The relationship between applied voltage and frequency is so precise that the standard volt is now defined in terms of Josephson junction oscillation frequency. The Josephson junction can also serve as a hyper-sensitive detector of low level magnetic fields. It is also very sensitive to electromagnetic radiation from microwaves to gamma rays. (a) Josephson junction, (b) Josephson transistor. Josephson transistor: An electrode close to the oxide of the Josephson junction can influence the junction by capacitive coupling. Such an assembly in Figure above (b) is Josephson transistor. A major feature of the Josephson transistor is low power dissipation applicable to high density circuitry, for example, computers. This transistor is generally part of a more complex superconducting device like a SQUID or RSFQ. SQUID: A Superconduction quantum interference device or SQUID is an assembly of Josephson junctions within a superconducting ring. The DC SQUID is only considered in this discussion. This device is highly sensitive to low level magnetic fields. Superconduction quantum interference device (SQUID): Josephson junction pair within a superconducting ring. A change in flux produces a voltage variation across the JJ pair. A SQUID is said to be sensitive to 10-14 Tesla, It can detect the magnetic field of neural currents in the brain at 10-13 Tesla. Compare this with the 30 x 10-6 Tesla strength of the Earth's magnetic field. Rapid single flux quantum (RSFQ): Rather than mimic silicon semiconductor circuits, RSFQ circuits rely upon new concepts: magnetic flux quantization within a superconductor, and movement of the flux quanta produces a picosecond quantized voltage pulse. Magnetic flux can only exist within a section of superconductor quantized in discrete multiples. The lowest flux quanta allowed is employed. The pulses are switched by Josephson junctions instead of conventional transistors. The superconductors are based on a triple layer of aluminum and niobium with a critical temperature of 9.5 K, cooled to 5 K.
High temperature superconductors: High temperature superconductors are compounds exhibiting superconductivity above the liquid nitrogen boiling point of 77 K. This is significant because liquid nitrogen is readily available and inexpensive. Most conventional superconductors are metals; widely used high temperature superconductors are cuprates, mixed oxides of copper (Cu), for example YBa2Cu3O7-x, critical temperature, Tc = 90 K . A list of others is available. [OXFD] Most of the devices described in this section are being developed in high temperature superconductor versions for less critical applications. Though they do not have the performance of the conventional metal superconductor devices, the liquid nitrogen cooling is more available. Most metals decrease resistance as they approach absolute 0; though, the resistance does not drop to 0. Superconductors experience a rapid drop to zero resistance at their critical temperature on being cooled. Typically Tc is within 10 K of absolute zero. A Cooper pair, electron pair, a quantum mechanical entity, moves unimpeded through the metal crystal lattice. Electrons are able to tunnel through a Josephson junction, an insulating gap across a pair of superconductors. 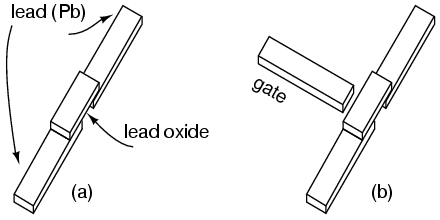 The addition of a third electrode, or gate, near the junction constitutes a Josephson transistor. A SQUID, Superconduction quantum interference device, is an highly sensitive detector of magnetic fields. It counts quantum units of a magnetic field within a superconducting ring. RSFQ, Rapid single flux quantum is a high speed switching device based on switching the magnetic quanta existing withing a superconducting loop. High temperature superconductors, Tc above liquid nitrogen boiling point, may also be used to build the superconducting devices in this section.